During the 1950s, a new genre emerged in Hollywood: the science fiction film. There were science fiction films before the 1950s, but after World War II, they really flourished. Many of these films were low-budget second features shot in black and white with sub-par special effects. 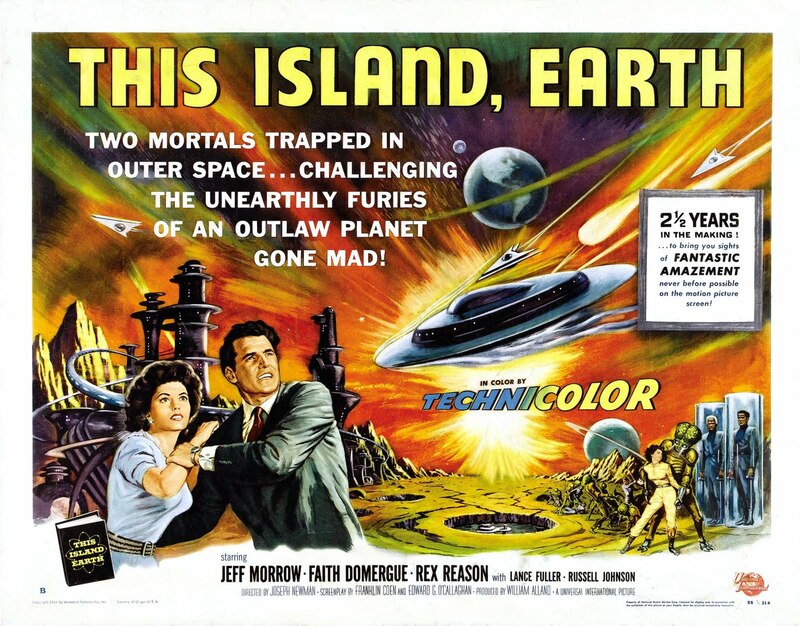 But in 1955, Universal International Pictures produced a big budget science fiction epic in three-strip Technicolor. The movie poster tells the story. The secret location turns out to be an estate in Georgia where Exeter has assembled scientists from around to world. 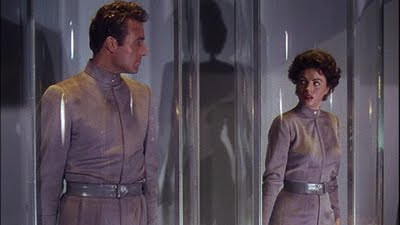 One of the scientists is Dr. Ruth Adams (Faith Domergue), someone Cal is sure he’s met before. Ruth says Cal has mistaken her for someone else, which just adds to the mystery. Another scientist at the compound is Steve Carlson (Russell Johnson*). The trio become fast friends, especially when they begin to suspect that the research may have a sinister edge and not the peaceful purpose Exeter has led them to believe. It’s at this moment that Ruth admits to Cal that she didn't acknowledge knowing him out of fear. Exeter and his main assistant Brack both have distinctively large foreheads, white hair, and tan complexions. These odd features give our trio pause as they plan an escape before they are put under the “sun lamp,” a thought control device used by the aliens. Ruth, Steve, and Cal have avoided the thought transformer for reasons unknown to them. As the scientists make their escape, Brack sets out to kill them. Steve sacrifices himself for Cal and Ruth, who escape the compound in a small plane. After taking off, Cal and Ruth’s plane is captured by a flying saucer captained by Exeter. The scientists journey with the aliens to Metaluna, which is under continuous attack by the evil Zagons. Cal and Ruth realize the desperate situation the Metalunans face; their planet is dying. Upon their arrival, Exeter introduces Cal and Ruth to the leader of the Metalunans, known as the Monitor. He orders Exeter to put the scientists under the influence of the thought transformer. Exeter finds that he cannot comply with the Monitor’s order. He defies his leader and takes Cal and Ruth back to Earth. As they leave the atmosphere of Metaluna, they witness its destruction. Exeter is his planet’s sole survivor. Exeter returns Cal and Ruth safely to Earth, but refuses the earthlings’ invitation to remain with them. With his spaceship running low on fuel, Exeter crashes it into the ocean where it is destroyed and with it any memory of the advanced civilization of which he was a member. 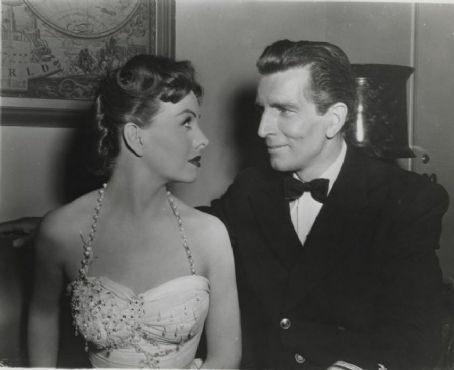 Joseph Newman directed Jeanne Crain and Michael Rennie in Dangerous Crossing. This Island Earth directed by Joseph Newman (Dangerous Crossing 1953), received almost overwhelmingly good reviews when released. The special effects, which were dazzling to audiences and critics in 1955, received the most acclaim. 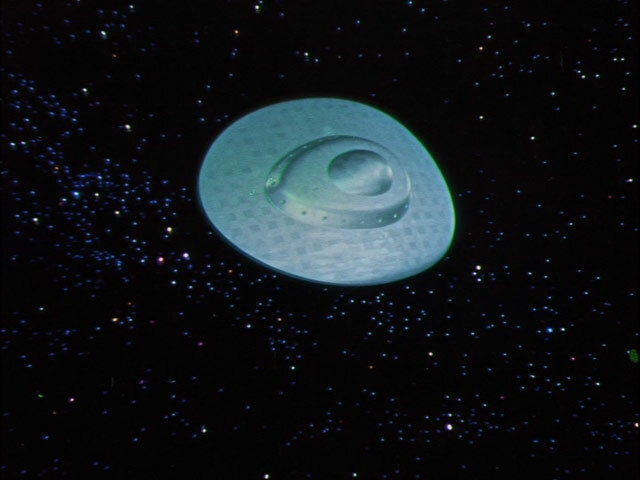 H. H. T. writing for The New York Times said the “panoramic vista of the doomed planet ‘Metaluna,’ should leave anyone bug-eyed.” He also noted the “reasonable acting and plucky, even literate, writing.” The film’s special effects reportedly were in production for over two years. For the film’s stars and director, all of whom are not and never were household names, This Island Earth is a high-water mark. 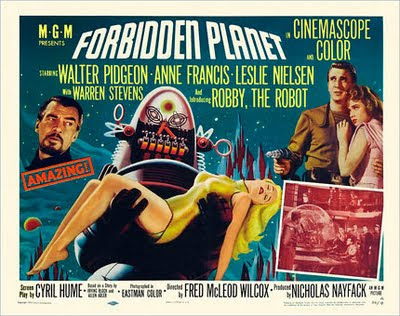 This Island Earth influenced Forbidden Planet released in 1956. An enjoyable and groundbreaking movie, This Island Earth has a strong narrative flow that sets it apart from the other science fiction films made during the 1950s. The sets, including the interior of the space ship influenced another science fiction classic movie released the following year, Forbidden Planet , as well as TV shows like Lost in Space and Star Trek. The film isn’t perfect and it did resort to some pretty tried and true B-movie cliches. For example, as Cal and Ruth are returning to Earth with Exeter, a stowaway alien mutant monster (a giant bug) infatuated with Ruth, chases her around the ship before being killed. And of course, Ruth is wearing a skin-tight spacesuit! Considering the bulk of the movie isn’t this blatantly exploitative, we’ll let it pass. After all it was the 1950s, right? If you’re a science fiction fan, you owe it to yourself to give this film a try. 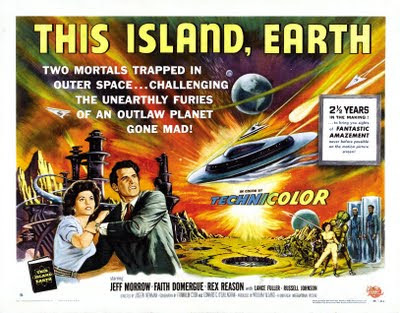 You’ll see that many of the genre’s conventions, popular today, emerged with This Island Earth. *Trivia: Russell Johnson who plays Steve Carlson went on to greater fame playing another scientist, Roy Hinkley, otherwise known as "The Professor" on TV's Gilligan's Island. Hello, This comment does not have anything to do with this post but I did not see where I could leave a different comment. I just watched The Razor's Edge. It was on Channel 11 so was shown in entirety without commercials. I enjoyed the costumes, the fact that it was placed in Chicago, and that Gene Tierney is now my favorite villainous! Subtle and creepy in a gorgeous way. This is one of my fav classics.